LG Electronics is a leading mobile handset manufacturer based out of Seol, South Korea. The company commands a good reputation for its cutting-edge technologies, unique products, and innovative designs. In terms of design, their latest handset LG G5 SE is a slightly varied variant of the LG G5. The smartphone ships with impressive specs which includes a powerful Octa-core chipset, a 5.3-inch QHD display, and dual 16 MP rear cameras. The price of the device in India starts from INR 35,000 and may be launched in January 2018. It runs on Android 7.0 (Nougat) with the company’s own User interface on top of it as OS. The LG G5 SE is driven by an Octa-core processor clocked at 1.8 GHz and sits on a Qualcomm MSM8976 Snapdragon 652 chipset. To support smooth multitasking the chipset is clubbed with a decent 3GB RAM.You are assured of an awesome gaming experience, thanks to the Adreno 510 GPU. The LG G5 SE features dual 16MP main shooters on the rear and comes with options like a Laser autofocus, CMOS sensor, and aperture of 1.8F, dual LED flash and Optical Image Stabilization. These options promise that the handset outputs superior quality images. An 8MP front-facing sensor is as well available for selfies. Moreover, this is a modular Android phone and enables different modules such as DAC Hi-Fi or CAM Plus unit. Things such as 4K video recording might not be as fast as the original G5 on account of the different chipset. The LG G5 SE features a 5.3-inch QHD IPS LCD display and has a smashing output: Pixel density of 554 ppi. The display resolution is 1440 x 2560 pixels. The Corning Gorilla Glass 4 helps guards the display against impacts and scratches. The phone boasts of a premium quality thanks to the magnesium chassis and a gorgeous matte finish. The display is combined with breathtaking viewing angles that generate bright and vivid colours. Phone users as well need not struggle much to view the display in bright sunlight as there are no major legibility issues. The device flaunts Always-on display that enables customers to comfortably check the time and date. The device thickness is 7.7mm and weight is 157 grams. On its rear, It features a fingerprint sensor. The device has 32GB of natïve storage to accommodate important apps. If that is inadequate, you can use a MicroSD card to upgrade the ROM up to 256GB. The LG G5 SE handset is juiced by a 2,800mAh Li-Ion removable unit. It is as well armed with Quick Charge 3.0 option, which energizes the phone very quickly. The LG G5 SE is really a powerful handset and comes packed with every desirable functionality to simplify your lives. Beginning with aesthetics, a nice display and perfectly performing shooters, the handset seems to have all important features. It as well has a massive battery supported with Quick-charge option. 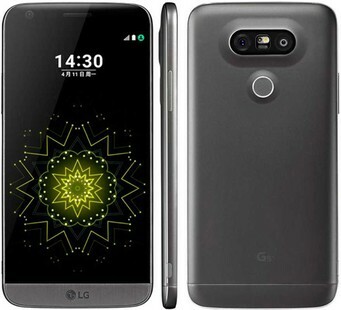 LG G5 SE full specs and reviews as of Apr 2019. Buy it here!